The year is 1667 and you are a pirate sailing the waters of the Caribbean. A Spanish Galleon floats nearby, and you’ve talked your crewmates into working together to steal all of its treasure. What you haven’t told your fellow pirates is that you have no intentions on sharing the treasure once you have it. Your crewmates have told you that they share your loyalty and that they’ll help you maroon the greedy pirates on your ship to the rocky island of Tortuga. But you’ve seen your friends’ loaded pistols and heard their whisperings of a mutiny. You know that nobody can be trusted. 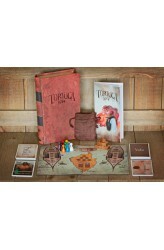 Tortuga is all about the interactions you have with the other players. In some cases, such as when you and your shipmates are attacking the Spanish Galleon, you need to rely on your enemies in order to ..